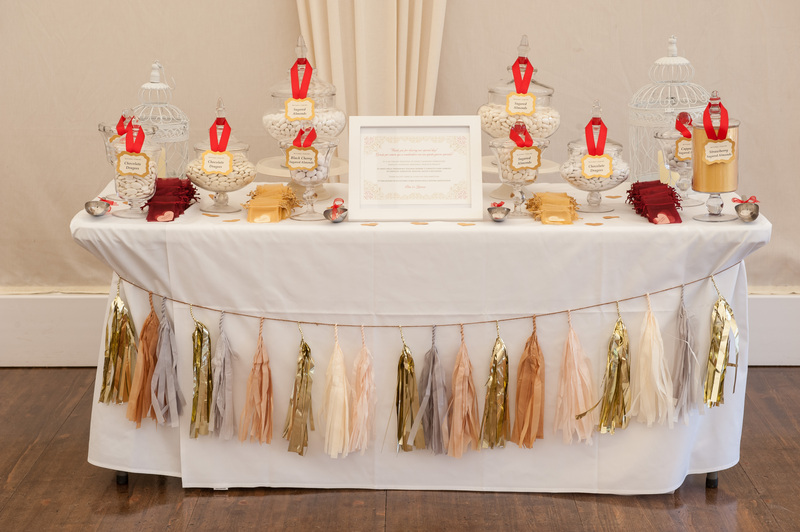 Last year I worked with an amazing couple Bee and Lorenzo to create a sugared almond sweet table. As Lorenzo was Italian and there would be a large number of their guests flying over from Italy they were keen to incorporate some traditions that would make them feel included. 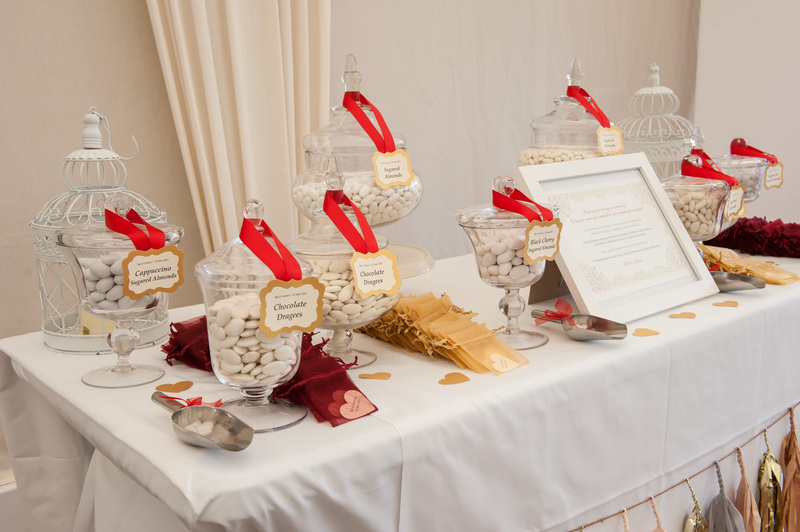 I must admit I hadn’t worked with sugared almonds much last year, 2013 was a year where wedding favours had become more creative and unique. DIY favours had become popular which was great as it really did add the personal touch to weddings. So sugared almonds may seem old fashioned to some, but really when you bring it back to basics it is a lovely tradition and they actually taste really nice! So what is the tradition all about? Five sugared almonds would be given to guests in either a small box or fabric pouch, the almonds each represented fertility, longevity, wealth, health and happiness. A kind of nice tradition don’t you think? Even though they have primarily been popular in Europe, Italy seem to be classed as the home of ‘Bomboniere’. Getting back to Bee and Lorenzo, they had decided to create a sweet table full of sugared almonds. This would also double up as wedding favours to their guests. Such a great idea as it wasn’t just a little nicely placed wedding favour at the guests tables. The sweet table had become a talking point. Guests had mingled around the table, talked about the tradition, the Italian guests felt appreciated. It was a win win really. The colour theme was red and gold. 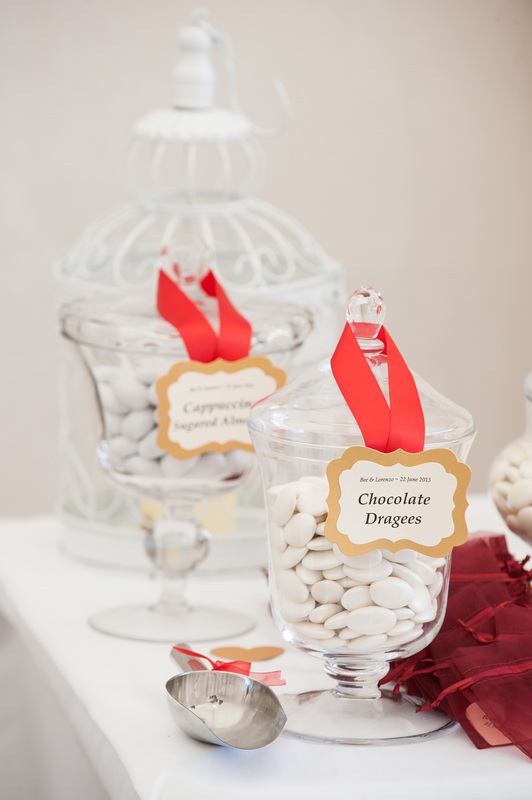 You can get some fabulous red and gold almonds, but on this occasion the white adds a nice contrast to the gold and red ribbons and candy labels. I use the BEST wholesaler for sugared almonds, they are all imported from Italy and they are TOP quality. The best thing is that they also stock chocolate dragees and flavoured sugared almonds which are honestly so tasty I can’t even tell you! She had flavours such as black cherry, cappuccino and strawberry. So what do you think of this tradition and the spin Bee and Lorenzo put on it? I was lucky enough to see Bee, Lorenzo and some of the guests still on the dance floor at the end of the night. People were still hovered around the table and I always breathe a sigh of relief when the table is pretty much empty, but their are still a few sweets lurking in the jars. Guests were back and forth from the dance floor to the sugared almond sweet table. At that time of the evening people had given up and putting their almonds in the pouch and hands were scooping up the almonds with pleasure.